Thus wrote Rabi Moshe ben Nachman Girondi, better known to us as the Ramban, after he was banished from the Catalan town where he was born and rose to prominence: Girona. When the Ramban left Girona in 1267, the city was at the height of its glory. Located along a trade route that connected the rest of Iberia with Europe, the city was an important economic and cultural center in Catalonia, a self-governing principality located in northeastern Spain. 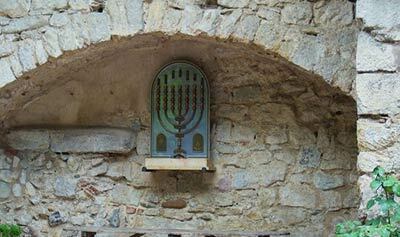 Girona’s Jewish community was already considered an ancient one by the Ramban’s time. Although no one really knows when Jews first arrived in the Iberian Peninsula, according to one legend they established trading outposts during the time of Shlomo HaMelech. The first written mention of a Jewish presence in Girona is a 10th century legal document, which relates that in the year 890 some 25 Jewish families living in Catalonia sold property to a Catalan nobleman and were compensated by being relocated to Girona. Girona’s first shul followed soon after. Its location is curious because it was situated between a church and a palace, suggesting the Jewish community had relatively good relations with both church and civil authorities. Those good relations with the church would begin to sour by the late 1200s. On Easter, for example, clergy and students would climb to the top of the recently built Cathedral’s bell tower and hurl stones down into the Jewish Quarter, which was literally just a stone’s throw away. A second shul was built around the year 1200, and this time it was situated within the confines of the Call. Also within the Call were the shops of the fishmongers and bakers and artisans, as well as a Jewish hospital, an orphanage and a hekdash that provided temporary lodgings for the very poor. Rich merchants, physicians and government officials lived in the Call as well, but the Jews weren’t forced to live together in one area at this time. Perhaps they felt there was safety in numbers, even though they were under the protection of King James I, who ascended the throne of Aragon and Catalonia in the year 1213. His reign lasted for 63 years, and these were generally very good years for Catalonia’s Jews. James was interested in increasing the prosperity of his country and his people. He turned the small city of Barcelona into a thriving port and during his reign Catalan ships ruled the profitable waterways of the Mediterranean Sea. Not only did he encourage his Jewish merchants to set up trade networks in both Christian Southern Europe and Muslim Northern Africa, he also encouraged Jews from France and Northern Africa to settle in his country by offering them land and property grants and exemptions from taxation. Jewish financial advisors, secretaries, and physicians could be found at the royal court in Barcelona, and James extended his royal protection to the Jewish communities of Catalonia, including the kehillah in Girona. These communities, whose internal governing body was called the Aljama, were autonomous; they were ruled by Jewish communal leaders who were responsible for issues such as maintaining law and order within the community and, of course taxation – and the Jews did pay very high taxes for the privilege of being protected by the king. Because the Jewish communities were “owned” by the Crown, the non-Jewish townspeople were, in theory, forbidden to harm them as they were the king’s property. 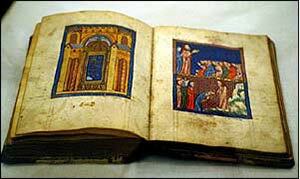 During his reign the Jews were, indeed, relatively secure and prosperous, and it was during this period that Catalan-illuminated masterpieces were created, such as the Golden Haggadah, the Barcelona Haggadah, and the Sarajevo Haggadah. This era was also a Golden Age of Torah scholarship in Catalonia. 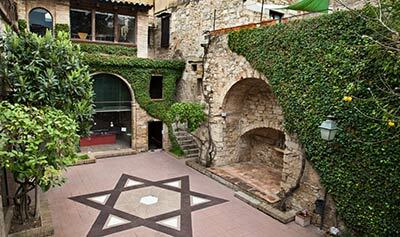 While Barcelona had a flourishing Torah community, it was Girona that put Catalonia on the Jewish map. Girona’s steep and shadowy stone staircases, with their furtive glimpses of dazzling blue sky, seem like a perfect setting for contemplating the mystery of Creation and other deep matters. 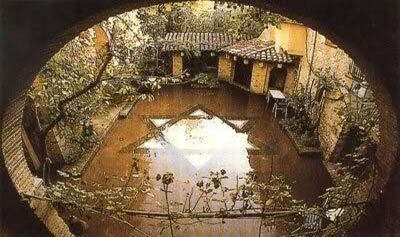 And, indeed, during the Middle Ages Girona was one of Europe’s most important centers of Kabbalah. Two of the early Girona Kabbalists were Rabi Ezra ben Shlomo of Girona and Rabi Azriel of Girona, who were students of the famous Kabbalist Rabi Isaac the Blind of Provence. They were both extremely prolific writers, and they got into trouble with their teacher for publishing their Kabbalistic works. Rabi Isaac believed, as others before him, that the Kabbalah should remain the study of a select few and not made accessible to the general public. Another Torah leader associated with Girona is Rabbeinu Yonah, author of the mussar classic Shaarei Teshuvah (Gates of Repentance). Rabbeinu Yonah, who was born in Girona, was a cousin of the city’s most famous Jewish resident, the Ramban. 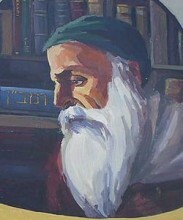 Born in 1195 to a family of Torah scholars, the Ramban studied Talmud with Rabi Yehudah ben Yakar and Kabbalah with Rabi Ezra and Rabi Azriel. He was eventually appointed the rav of Girona, and later became the chief rabbi of Catalonia. When he was 70, the Ramban’s relatively quiet life was interrupted by a royal summons from King James, who “invited” him to Barcelona to take part in a Disputation or public debate. The Ramban’s opponent was Pablo Christiani, a former Jew who had converted to Christianity and become a Dominican friar. Not content with his own apostasy, the friar took upon himself the mission of converting other Jews to Christianity. One way he intended to do this was to debate Catalonia’s greatest rabbi and prove his adopted faith was the true one. However, the Ramban won the Disputation. The Church sought revenge and found it in the Ramban’s Sefer HaVikuach, his written account of the Disputation. After the Church claimed the book contained blasphemies against the Christian religion, Pope Clement IV sentenced the Ramban to perpetual banishment. The Ramban left Girona in 1267. His destination was Eretz Yisrael, where he established a shul in Jerusalem. It was also in Eretz Yisrael that he wrote his famous commentary on the Torah and Iggeres HaRamban, his letter of ethical instruction to his son Nachman. After King James died in 1276, Catalonia entered a long period of political and financial instability, which was intensified by the arrival of the Black Plague. There had been previous attacks on the Call, but when the Black Plague reached Girona in 1348, the Jews were accused of having caused it and the attack upon the Call was particularly vicious. However, the worst was yet to come. In 1391, angry peasants stormed just about every Jewish Quarter in Spain, including the Call of Girona, and destroyed most of them. Before the rampage ended, tens of thousands of Jews were killed, while many others were forced to convert. Some of Girona’s Jews managed to flee to the Gironella Tower, a military fortress, where they held out for 17 weeks. When they were finally able to return to the Call, there was very little to return to. Their homes, businesses, shuls and study halls had all been destroyed. During the century that followed the situation deteriorated even further. In addition to being forced to live inside the Call, in 1486 the Jews were forced to wear special clothing to distinguish them from Christians. By the time of the Edict of Expulsion in 1492, all doors, windows, and alleyways that looked outside of the Call had been bricked up, turning the Call into a ghetto similar to what would later be seen during the Nazi era. Physical attacks against the Jews also increased, and as the community became more and more marginalized and impoverished, the pressure to convert increased as well. But even though many of Girona’s Jews converted to Christianity during the 15th century, they soon learned that this was no solution. In 1478 the Spanish Inquisition was created and given the mission of hunting down Conversos who were practicing Judaism in secret. Although the Catalan noblemen weren’t as enthusiastic about the Inquisition as the new rulers of unified Spain, Ferdinand and Isabella, courts of the Inquisition were set up in the major cities. 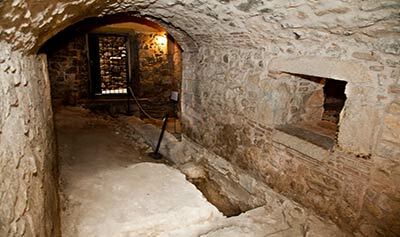 In Girona, 84 Conversos were tried for the crime of being secret Jews. More than 60 of them managed to flee in time, and so only their effigies were burned. But ten of the accused were burned at the stake. By the time of the Expulsion, Girona’s Call had dwindled to only 20 Jewish families. Half of them converted, while the other half went into exile with Spain’s other Jews. One of the members of the kehillah who chose exile, Bonastruc Benvenist, sold all his goods provided he would be able to buy them back if he returned within a year, because he was convinced the Jews would be allowed to return. But the Jews never came back. In the centuries that followed, the Call and the Jews who had once lived there were forgotten. But in the 1970s there was a renewed interest in the now rundown area. Some local historians and archeologists began to search through Girona’s archives, uncovering documents that led them to believe the long-forgotten Jewish Call was hidden amidst the rubbish and dilapidated buildings. Girona’s mayor initiated a project to rehabilitate the Call, and today it’s the best preserved Jewish Quarter in Spain—although you still won’t find any Jews living there. Previous articleWhy Do We Fast on Asara B’Tevet? It is a nice day trip from Barcelona. The museum is fascinating. Unfortunately, there is no place in the city to get a kosher bite to eat.